FreePlay is made to present. Great for corporate events when a lightweight, compact set up is required, FreePlay is perfect for bars, restaurants, hotels and schools. Battery operation makes it ideal for use in mobile worship, field trips and more. Its lightweight, compact design and simple setup gives you up to 10 hours of presentation on a single charge. FreePlay is made to play. 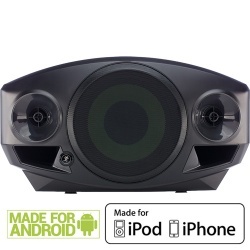 Bluetooth music streaming turns any event into a party using your favorite app or music library. Choose your music and control it all from anywhere in the room. Having a karaoke night? FreePlay lets you connect up to two microphones. Perfect for weddings, birthdays, BBQs and more, compact design and simple setup gives you up to 10 hours of play on a single charge.